The rules are the same but the laughs are bigger and thrills are better. 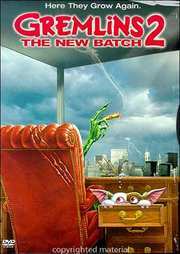 This time Billy and everyone`s favorite Mogwai, Gizmo, must face off against a new batch of Gremlins that definitely think New York is their kind of town. ` Plus, feed on a great batch of extras including never before seen footage, a "behind the scream" look at working with the Gremlins, a full-length audio commentary and much, much more!